True Diamond Nail Armor is in a rising category of diamond-infused nail coatings which provided a stronger coat than standard nail polishes. It is new to the market, but competitively priced. 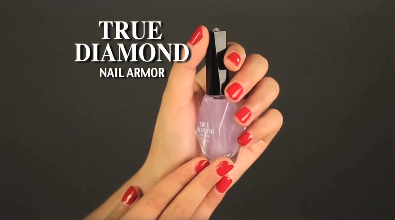 True Diamond Nail Armor is a clear nail coating which is infused with actual diamond particles. Products which strengthen nails is something of a holy grail in the manicure world. With True Diamond Nail Armor, we are promised just that: a way to strengthen nails with a coating of actual diamond particles. Reviews for these “diamond” nail products tend to be mostly positive, bolstering the claims that they provide a stronger coat than typical nail polish. True Diamond Nail Armor appears to be in the test marketing phase, with very limited advertising on television and online. When we obtain a sample of the product, we will update with a more comprehensive review. It has been our experience with similar products, however, that this category of nail polishes and bases are superior to their traditional counterparts. True Diamond Nail Armor is priced competitively. There are a number of “diamond” referenced coats and polishes to be found on Amazon, many of which are roughly priced the same as True Diamond Nail Armor. If you’ve used True Diamond Nail Armor, please give it a star rating and comment below.